A wedding in the Bahamas might just be the pinnacle of romance. 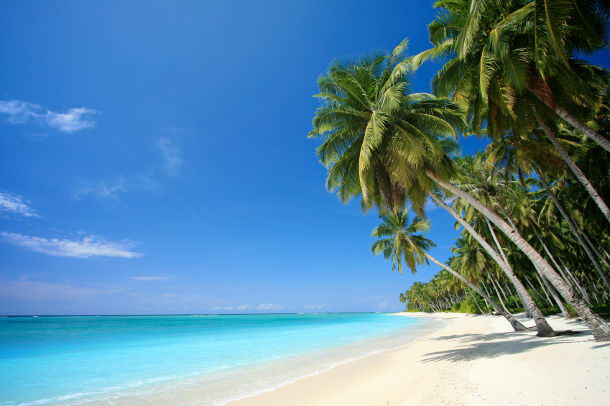 Think of deserted white sandy beaches, crystal clear turquoise waters and palm trees. Picture all the Caribbean hallmarks—steel bands, sunshine and congenial, laid-back people. It’s a remarkably flexible destination; you’ll have the freedom of secluded tropical beaches and whole networks of islands and cays undisturbed by human development. Or you might plump for the luxury of first-class resorts, where your every whim will be catered to, and there’s a vast array of activities and indulgences on hand. When most people think of the Caribbean they think of pristine beaches fringed by palms, and the Bahamas does not disappoint. It features some of the top beaches on the planet. On the leeward side, facing away from the Atlantic, there are countless sandy bays, sloping gently into crystalline waters. It’s also a country perfect for people with use of a yacht or other vessel. This way you can see where your curiosity takes you and explore some of the Bahamas 2,000 islands and cays. Sightseers can delight in the many picturesque towns, showcasing a style of architecture that was brought to these shores in the late-18th Century. In Nassau there are historic forts, remnants from the American revolutionary war or constructed to repel pirates. For ecotourists the choice of destinations is almost unending. Natural landmarks in the archipelago include many Blue Holes, underwater sinkholes that reach incredible depths. Dean’s Blue Hole on Long Island is the deepest in the world, plunging 200 metres below the surface. Offering reefs flush with wildlife, underwater caves and shipwrecks, the Bahamas are ideal for divers and there’s no end of companies to help you on your way, whether you’re a novice or seasoned explorer. The Bahamas have a tropical climate. This entails two seasons with distinct weather patterns. Winters, from November to March, are pleasantly warm, with daily highs that get up to the mid-20s and tend not to slip below the mid-teens at night. Rainfall at this time of year is relatively scarce, occurring only in short bursts. Summers on the other hand are consistently hot here, with temperatures climbing above 30˚C between June and September and coinciding with high levels of humidity. In this season there’s more rain, but it also falls in brief but dramatic downpours, taking place with greater frequency in the months of June and August. One of the best-known elements of Bahamian culture is the music, which includes varieties such as calypso, soca, rake & scrape and junkanoo. Rake & scrape is percussion-led music that originated on the neighbouring Turks and Caicos Islands, but gained fame after being brought to the Bahamas by immigrants. Calypso and its descendant soca are popular throughout the English-speaking Caribbean, but started out in Trinidad and Tobago. Junkanoo takes its name from the celebration in which it’s played, taking place on 26th December and 1st January. The Bahamas are renowned for their safety as well as the friendliness of the population. Almost all of the country’s violent crime is confined to a small portion of the city of Nassau, and it is claimed that most victims of the worst crimes here are already known to police and engaged in gang activity. Natural products of the Bahamas include sugar cane, a range of spices, lime, pineapple and coconut, which are used in a variety of dishes and drinks. Seafood is also a staple, with crab, lobster, crayfish, bonefish grouper and conch frequently appearing on menus. Fish here is usually fried and grilled, but is also used in traditional stews. Classic meat dishes in the Bahamas normally use either grilled goat or chicken, and are served next to grits (maize porridge), rice and peas, sweet potato or potato salad. Alcoholic beverages include a number of locally brewed beers, but the main drink is rum, which is distilled from sugar cane by-products. Coconut water, and a range of freshly pressed fruit juices are locally sourced, non-alcoholic alternatives. The Bahamian Dollar (BSD) is the currency here, which has exactly the same value as a US dollar. This also means that US dollars are widely accepted. The Bahamian dollar also has the same denominations as its US equivalent, except for some interesting quirks like the 15-cent coin and three-dollar bill, although these values are rare today. There are a host of companies that offer wedding packages in the Bahamas, taking care of details ranging from documentation to bridal bouquets. For basic, small and intimate ceremonies this will cost around $825, and for more lavish weddings, involving upwards of 50 guests, limousines, professional photography and even steel bands the price will reach $10,000 or more. The following notes are not comprehensive and are intended as a guide only. Before planning your wedding in the Bahamas we strongly advise you to contact the Bahamian embassy in your home country or your country's embassy in the Bahamas to obtain up-to-date legal requirements. Visitors need to be on Bahamian soil when applying for a marriage licence, and need to have been in the country for 24 hours before the wedding can take place. The Bahamas feature more than 2,000 islands and cays, many of which are uninhabited. They are scattered in a rough arc over a large corner of the Atlantic Ocean, from 50 miles off the coast of Florida in the northwest to 60 miles north of Haiti at the south-easternmost point. If you’re travelling from island to island the main way to get around is by boat, which is the cheapest, most frequent and most flexible mode of transport. The simplest way to divide the Bahamas is to break it down into 16 islands and archipelagos, each with something to offer, whether you want colourful resort life or seclusion and serenity. Find out more about the Islands of Bahamas or browse our Bahamas Wedding Directory to start planning your dream wedding.